Ken Wilson's Classic Rock is one of the most popular and iconic works of climbing literature ever written. Along with Hard Rock and Extreme Rock, it has acquired something of a legendary status. First published in 1978, Classic Rock represented the absolute best of British climbing at that time, quickly establishing itself as a must-have publication. It is a celebration of 80 of the best lower-grade routes in the UK, bringing them to life through a superb selection of photographs, anecdotes and essays from some of the most accomplished climbers of the day. 'Ticking' the book became an instant and obvious challenge, and remains so to this day (Wilson wasn't a fan, describing it as 'puerile ticking'). Any climber working his or her way through the book will be taken on a tour of the finest routes on the best cliffs and crags to be found throughout England, Scotland and Wales. Many of the routes in the book were established over a century ago. At that time the Victorian and Edwardian alpinists, flushed with successes abroad, sought harder challenges at home. With their well-honed confidence, they went straight for the biggest cliffs of Scotland. Anyone seeking to retrace their steps will immediately be transported to bold lines of weakness up otherwise daunting precipices! Before long these pioneers trailed their hemp ropes and balanced their hobnail boots up the sea cliffs of Cornwall and the gritstone edges of the Pennines, and the crags of the Lake District and North Wales. These climbers provided us with a great national treasure a repository of adventure and spectacle that can provide a lifetime's enjoyment and challenge. Classic Rock provides a mere sampling of these treasures. This latest edition has been transformed with over 300 new colour photos. These sit alongside archive images to create an inspirational dialogue between today's climbers and those of history. 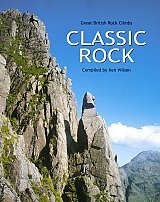 55 chapters, contributed by acclaimed climbers and writers such as Jim Perrin, Paul Nunn and Angela Soper, describe the finest classic rock climbs in Britain.